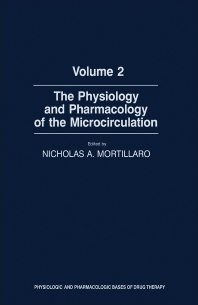 The Physiology and Pharmacology of the Microcirculation, Volume 2, discusses the microcirculatory function of specific organ systems. The first volume of The Physiology and Pharmacology of the Microcirculation presented some general aspects of microcirculatory function and then concentrated on the microcirculation of a specific organ system, namely, brain, eye, heart, and kidneys. This second and final volume continues the presentation of microcirculatory function of specific organ systems. The book begins with a chapter on the microcirculation of the lungs, with a description of its microcirculatory features and current methods of study. This is followed by separate chapters on the microcirculation of the splanchnic organs. These include the stomach, emphasizing hemodynamics, tissue oxygenation, and control of blood flow; the small and large intestine. Subsequent chapters deal with the microcirculatory responses of both the liver and spleen to different physiological and pharmacological challenges; the microcirculation of the skin, with emphasis on human microcirculation; normal and abnormal microcirculatory dynamics in skeletal muscle; microcirculation of bone; and microcirculation of the salivary glands and exocrine pancreas. The final chapter presents a selective review of pathological events involving the microcirculation, with the emphasis directed toward human diseases.